Brand A, the leader in a certain food category, was winning for having better flavor and texture, better packaging and way stronger brand loyalty. This wasn’t overly surprising; the consumers in this group had been selected for their preference for Brand A. So naturally, they had a lot of positive comments about the brand. What might seem unusual is that the client for this focus group was actually Brand B. And they were taking a beating. 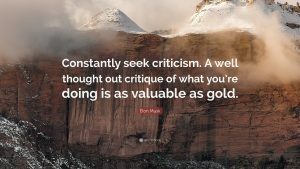 Certainly, you should seek praise for your brand but seek criticism as well. Ask people what you could do to make your product or service better. What do they like about competitive brands? What are the key attributes they compare to make a choice between brands? If possible, try to isolate their perception of the brand from individual products or services. For instance, you can ask which brand they would choose (and why) if the products were identical and cost the same.